Fin-tech Tackle Company is located in the heart of Walleye and Smallmouth country in Northwestern Wisconsin. 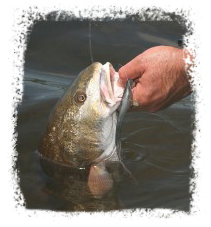 We offer an innovative line of quality fishing products that earned the respect of discriminating fishermen everywhere. The bottom line for any fisherman is to catch fish. Sure, you can use the excuse “the fish weren’t biting” but with the right tools, any day can be fun and productive. At Fin-tech, our “products by design” are special tools to get the job done right and with ease. Since the introduction of the Nuckle Ball® Jig, anglers have looked to Fin-tech Tackle for the latest in innovative designs and our commitment to quality in fishing lures. The introduction of the Title SHot® Jig has created a lot of excitement in the bass fishing circles. The heart and backbone (literally) of the Title SHot® Jig is the patented Retainer/Guard System, with pressure applied, the Retainer/Guard collapses rather than flexing, allowing the jig’s full bite to come into play. No fiber-guard bumping to impede jig consumption, more hook-ups. The bullet style head is virtually weedless and features Mustad’s Ultra Point wide gap hook. The Title SHot® Jig will not rotate on the retrieve, eliminating line twist, excellent for rigging of all soft Plastic lures, including spider grubs and tubes.